I wrapped up my stay in Hawaii much as it began – by learning about the fantastic and unique history of the islands as a part of the United States. Pulling out from the Kaloko-Honokohau National Historical Park in my rental car and turning right, heading toward Kona, I thought of how much I had left to learn about Hawaii’s fantastic history. Despite all of the places I visited, there was still so much for me left to learn; and the day of my return to do so cannot come soon enough. My historical lesson through travel began a week prior to my stop at the National Historic Park with a visit to the Iolani Palace – the Honolulu residence for Hawaii’s monarchy at the end of the 1800s. The stunningly beautiful hallways and rooms tell a story influenced more by European powers – bringing thoughts of the Palace of Versailles to mind – than those of the palm trees and nearby beaches. As one of the most important historical locations on any of the islands, it was exactly where I wished to begin my trip. 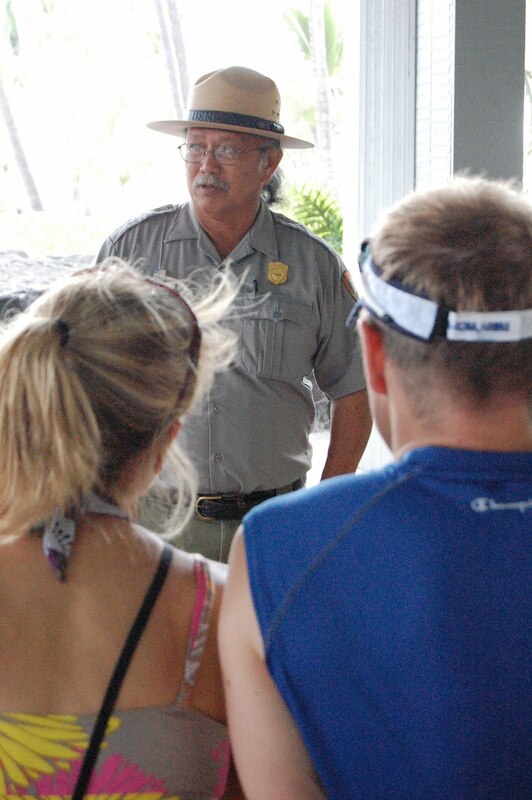 The Iolani was the first stop on my sponsored trip by the Hawaii Visitors and Convention Bureau. I considered it to be the perfect place to begin learning about the history of a state that is so unlike that of the mainland in many ways, largely because those states were occupied and organized by various colonial powers. Hawaii, instead, was settled by the Polynesian people from other islands farther west into the Pacific Ocean; the colonial influence would come centuries later, as can be seen in all details, like the window etchings, of the ornate Iolani Palace. Queen Lili-uokalani was replaced in January 1893 by a provisional governement, largely because she refused to fight; she did not want bloodshed and for her people to die. President Grover Cleveland demanded the queen’s reinstatement, but the provisional government refused. The Republic of Hawaii ultimately developed from that government, later becoming the Territory of Hawaii under President William McKinley in 1898, and the 50th state in the Union in 1959 under President Dwight D. Eisenhower. Despite the very informational palace tour, I was missing a lot in regards to Hawaii’s history. Sure, I had a general idea of things from the late 1800s to the present, but there was so much before that time that I knew I had to continue on to the nearby Mission Houses Museum. There I was able to visit the oldest-standing house in all of Hawaii (below picture’s left), learn about the history of the missionaries to the islands, and more about life in the Kingdom in the early 1800s. I came away with two “fun facts” from my personal Mission Houses Museum tour: The first was that Hiram Bingham‘s grandfather was a missionary. I instantly recognized the name, but couldn’t place it, so my tour guide gave me a helpful hint – the man who rediscovered Machu Picchu. The other interesting factoid that I returned to the mainland with was that King Street, which is where the museum now sits, was thus named because the King would walk down it daily, passing by the missionaries, to see what they were doing. Both tours – the Iolani Palace and the Mission Houses Museum – were excellent and I was pleased that I started my trip to Hawaii visiting them. But, there was so much more for me to learn about Hawaii that I wanted to continue on. So, despite a pair of tired feet, I made my way a few short miles to the Bishop Museum. It has been a long time since I have been so impressed by visiting a natural history museum, but the Bishop Museum absolutely wowed me. It is most certainly smaller than i ts New York cousin, the American Museum of Natural History, but I thought it lived up to it in so many respects that I would place it on a list of must visit sites for anyone traveling to Oahu, particularly for families. The incredible learning opportunities seemed almost endless; not only was there personal instruction and presentation on the history of the Hawaiian Islands, but there was also a lot to learn about the natural history from the mainland – like an amazing temporary dinosaur exhibit. Near the end of my visit, I partook in a small guided tour of the main hall – the Hawaiian Hall – and learned more about the Kings of Hawaii, particularly Kamehameha the Great; he united the Hawaiian Islands under his rule in the late 1700 and early 1800s. I had read a little about him and his descendents prior to my arrival, but it was helpful to tour the museum on my own and later learn more from on the guided tour. As I left the Bishop Museum – excited at having learned more about the history of Hawaii, as well as having participated in a short hula lesson – I oddly felt more uninformed than before I had arrived. Yes, I had devoured a huge amount of information, but the more I learned the more I reazlied there was that I did not know. And so, while I greatly enjoyed my remaining days on Oahu, I was excited to head to the Big Island to learn more. I started my time on the Big Island with several stops around Hilo, which I’ll talk about later, as well as a couple of days in the Hawaii Volcanoes National Park. Both places were fantastic, but I was focused on other things at my stops rather than the history of Hawaii. It wasn’t until I headed toward the Kona side of the island that I picked up my historical tour. I arrived at Pu’uhonua o Honaunau National Historical Park – which is set to celebrate its 50th anniversary on June 24th – late in the afternoon following a long drive from the Hawaii Volcanoes National Park. I was tired from an already long day, but excited to explore the park. Thankfully it was a sunny and clear afternoon, which I learned is more common around the desert-like landscape of Kona than it would be on the Hilo-side of the island or even over on Oahu – where they frequently experience brief showers. I walked on the sandy beach around a small cove where the ali’i, or chiefs, in a time around the 1500s were only allowed to tread. It was sacred ground and no others were allowed to walk there; commoners couldn’t even allow their shadows to fall on the land at that time. But it was here where they could also find refuge if they broke a kapu, or law. enter the sanctuary, the pu’uhonua, they could ultimately be forgiven for their law breaking by one of the priests. It was only at this point that they would be given a second chance and allowed to reenter society. I paused briefly to partake in a ranger-led tour, but largely followed the tour in the brochure. I found it fascinating, but also didn’t want to linger because I wanted to see yet that day where Captain James Cook first landed on the Hawaiian Islands. It was only a short drive up a few narrow roads, so I quickly made my way when I was done at the Pu’uhonua o Honaunau National Historic Park. Sadly, I could spend no more than five minutes at Cook’s landing site, since it was infested by a large tour group from Germany. Their constant chatter broke what would have otherwise been a serene location to relax for a couple of hours and listen to the waves roll in along the shoreline. It was only at the Kaloko-Honokohau National Historic Park, where I learned how Hawaiians survived the difficulties on such a hot and barren land, that I was allowed to listen to the waves again. There it was quiet and peaceful, with few other visitors, like I had hoped; anyone else nearby was just as content to relax and listen to the sounds of the ocean. And a lot can be learned in such sounds, since it was on them that the peoples of Hawaii arrived as early as 300 B.C.